I used to live in Alaska. My husband and I met and were married there. There are things that I miss about Alaska. Like the mountains, oh the mountains, and the wildlife and the fresh fish. But I don’t miss the mosquitoes, or the cold wet summers. Now, summer can be beautiful in Alaska. Short, but beautiful. There are summers that are warm and sunny. However, every few years summer is not like summer at all. This was one of those years. We had a couple of beautiful days, we even went swimming one day. But most of the time it was cool and raining. We had been planning our Alaska trip for several months. Meaning that my husband bought plane tickets and then we did nothing at all to get ready until the day before we were set to leave. I looked online to find a packing list for summer in Alaska. Go ahead and look, the pickings are very slim. Especially if you aren’t going on a cruise. Luckily all I had to do was think back a few years and remember what I wore. Mostly jeans and short sleeve shirts. Maybe a dress, if it was warm enough. Shorts and tank tops aren’t really necessary in Alaska. To complicate matters our stay was for one month. And I had no idea how often we would have access to a washing machine. 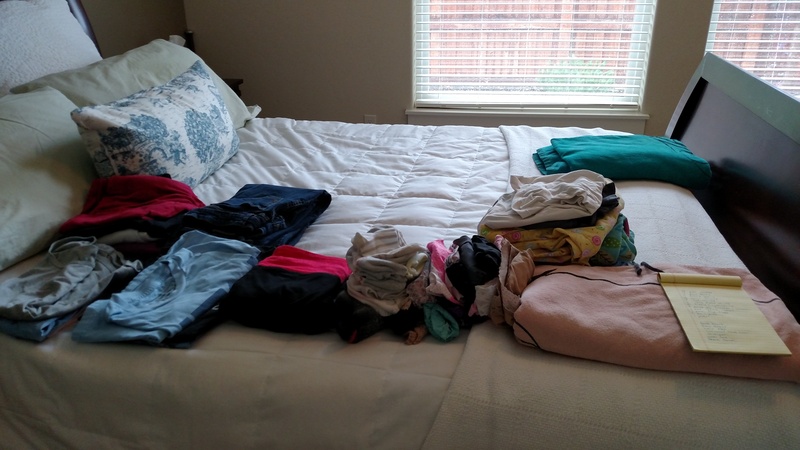 So, here is what to pack for one month in Alaska in the summer. This is an updated list of what I should have packed. I actually brought two swim suits, but only wore one and I only brought 7 pairs of socks and bought 2 more while we were there. And one day I borrowed a pair of shorts from my aunt. This is what I wore on the plane. The pants have a stretch waistband and are super comfy. I am not a fashion blogger (obviously), but I don’t want to look like a hot mess when I travel. 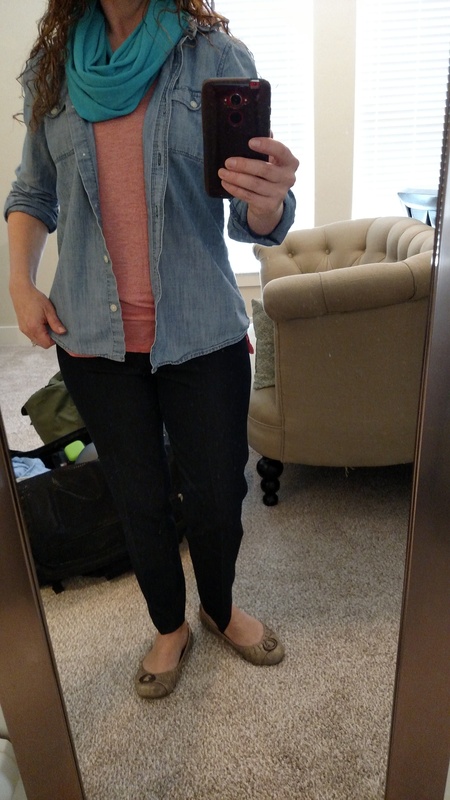 This outfit with the stretchy pants and tank top under a button down denim shirt was comfortable and didn’t look horrible. I call that a win. We had a wonderful time visiting family and friends. And I am so happy to be home! Please remind me to NEVER fly the red-eye again, especially with children. Spring break in Idaho and my husband lured me to McCall with promises of hot springs. The day before we left he found out (shocking) that Gold Fork hot springs is closed on Tuesdays so we would have to find something else to do. Like take our girls skiing. My idea of skiing includes me by a fire with a hot drink, not actual skiing or running down the bunny slope beside my daughters. I love my children and I want them to do things I never got to do, like ski. But, I don’t like snow or cold or icy roads or going fast down hills. My husband has decided that we should go skiing once a year. This is after the last time we went skiing (3 years ago) and he declared that we were not snow people and would never go again! Next year I’m asking for a sled. While in McCall we did visit two hot springs. Gold Fork, south of town is a favorite with our family. And Zim’s, north of Brundage Ski Resort will not make the favorite list. I’m starting a list. Faves: We have visited Gold Fork twice now and Miracle multiple times. They both have multiple pools at different temperatures. We like that Miracle has nice bathrooms and showers, plus they have camping available. Gold Fork has porta-potties and no over night accommodations. They are both outdoors. We stay in McCall when we go to Gold Fork and Twin Falls when we go to Miracle. Nope: We have gone to Given’s a couple of times because it was pretty close to our old house. It reminds me of the public pool I grew up swimming in. It isn’t fancy or updated. It’s a bit trailer park-ish. It is covered, there are flush toilets and the pool is big and warm. Zim’s also is not fancy, there are two outdoor pools. One is warm and goes to 9′ deep and the other one is hot and is for soaking only. I’m not sure how often they clean the pools at Zim’s, but the walls were covered in algae when we were there. Maybe: Silver Creek was one of the first hot springs we visited in Idaho. It is part of a campground. The pool is outdoors and is not covered. It has a big shallow area great for kids and for sitting. Roy Stone is outdoors, but covered and is like a warm swimming pool. I would like to go again if we have friends or family because you can rent the pool for something like $20. Plus it is close to home. We can go for the afternoon. Banbury is right across the road from Miracle and is owned by the same people. The pool is large, outdoors, uncovered. It is great for swimming. They have camping and RV spots. If you are staying there you can go to Miracle as well. We really liked to swim in the morning at Banbury and soak in the evening at Miracle.